Joomla CSS Guide have released JCSS Hosting, a new three column fixed width theme to it's club members. This theme comes with three module styles in three different colour schemes, offering stunning fresh design for your Joomla powered website. 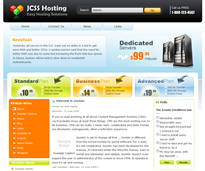 JCSS Hosting is a perfect theme for web hosting and domain registration companies wanting something new. Click here for a demo or more information.